YouTube TV Vs. DirecTV Now - 8 Things You Need to Know. Sick of paying an enormous bill each month for cable? The average cost of a cable bill has surpassed $100/month – so it’s no surprise that people all across America are ditching cable in record numbers. But what are your options for watching your favorite shows, sporting events, and news channels without cable? It can be confusing to navigate the world of “cable replacer” internet TV services, such as YouTube TV and DirecTV Now. In this guide, we’ll discuss the basics of two of the most popular cable alternatives – YouTube TV and DirecTV Now – and help you figure out which one is a better choice for your particular needs. YouTube TV Vs. DirecTV Now: Which is Better? Do you want HBO and premium networks? Is DVR service important to you? Will you be sharing your account with anyone else? YouTube TV and DirecTV Now are both “skinny bundles”. These internet TV services allow you to purchase a pre-selected package of cable channels for a low monthly fee. Neither of these services requires a cable box or any kind of installation. TV is delivered directly over the internet. In addition, they are much cheaper than traditional cable packages, and do not have any long-term contracts. You pay month-to-month, and can cancel at any time. Now, let’s dive into the specifics of each of these streaming services. DirecTV Now is run by DirecTV, which is owned by AT&T. Given the size and scope of DirecTV and AT&T, it may come as no surprise that DirecTV Now offers the best selection of channels available on any internet TV service. Unlike some other streaming services, DirecTV Now lets you choose which selection of channels you want, and offers four different subscription tiers. The best feature of DirecTV Now is their lineup of cable channels. You get a comprehensive package no matter which subscription you choose. If you’re looking for a low-budget cable replacer, you can choose the inexpensive $35/month “Live A Little” package, which includes 50+ channels. And if you are a huge TV fan who needs comprehensive channel coverage, you can get the $70/month “Gotta Have It” package. The choice is yours. DirecTV Now also offers “TV Everywhere” logins. You can use your DirecTV Now membership to log into the apps and websites of dozens of different cable networks. While plenty of other services – including YouTube TV – offer TV Everywhere, DirecTV Now has the most partnered networks by far. DirecTV Now also supports just about every major streaming device with slick, streamlined apps. You can stream on iOS, Android, web browsers, Amazon Fire TV, Roku, Apple TV, and Chromecast. The primary downside of DirecTV Now is that it lacks some features that should be standard for any internet TV service. There is no DVR service available, except for DVR beta members. And while the DVR should be available by late spring for all DirecTV Now members – for no extra fee – it’s expected to only offer a measly 20 hours of storage. You can also only stream on 2 devices at once with DirecTV Now, which makes it less-than-ideal for sharing among families or housemates. As of January 2018, DirecTV Now had more than 1.2 million subscribers. YouTube TV is the latest entry into the world of internet-based cable alternatives, built by Google. It’s designed to offer a good package of channels and great features at a reasonable price of $40/month. While YouTube TV was available to some geographic regions as early as Spring 2017, it did not expand until late 2017, when it became available in almost every area of the United States. YouTube TV offers only one package of channels, but has fairly comprehensive coverage. You can get sports coverage from channels like ESPN and Fox Sports, entertainment channels like FX and AMC, and cable news coverage from CNBC, Fox News, Newsy, and more. Beyond a solid channel lineup, YouTube TV has a few other features that make it great for cord-cutters – particularly those who plan on sharing their accounts with friends or family. First, you can watch YouTube TV on 3 devices at once, which is better than the 3-device restriction of DirecTV Now. You also get a much better DVR, and can create up to 6 different user accounts with YouTube TV. YouTube TV is more expensive than DirecTV Now, but this wasn’t always the case. In March, 2018, the price jumped from $35/month to $40/month. While this pricing hike did include quite a few new channels, it still makes YouTube TV more expensive than DirecTV Now. You also can’t stream on quite as many devices as DirecTV Now. Amazon Fire TV, for example, is not supported by YouTube TV. Streaming device support is also a little bit more limited than Sling TV. You won’t find a YouTube TV app for Amazon Fire TV, for example. YouTube TV has about 300,000 subscribers, which is pretty impressive considering how new the service is. YouTube TV only offers one package of channels, with about 50 channels available. (This number may vary based on your location). Even the lowest-cost “Live A Little” package provides you with more channels than YouTube TV, and for a few extra bucks per month, you can get over 100+ channels. If you love watching content on quite a few different channels, DirecTV Now is probably a better choice for you. This fact alone may make quite a few people choose a different streaming service. The company has repeatedly claimed that they will be releasing a free DVR for DirecTV Now members by “Spring 2018”, but there still has been no release date announced. DirecTV Now does not have a DVR at all, and only offers 2 simultaneous streams. They plan on offering an optional upgrade to offer a third simultaneous stream at some point in the future – but again, they have been frustratingly opaque about release dates. In contrast, YouTube TV has excellent features that blow DirecTV Now out of the water. First, YouTube TV has a DVR that lets you record unlimited episodes of shows for up to 9 months. There are no other restrictions. You can save as much content as you want. You can also create up to 6 accounts for individual YouTube TV users. This makes it easy to manage sharing an account between your family, or other members of your household. Finally, you can stream on up to 3 devices at once with YouTube TV, which puts it ahead of DirecTV Now. If you’re interested in adding premium channels like HBO and Cinemax to your subscription, DirecTV Now is your best bet. Most other internet TV streaming services charge $15/month for premium channels like HBO. DirecTV Now, in contrast, offers HBO and Cinemax for only $5/month apiece, and Showtime and STARZ for $8/month. If you want to watch shows like Game of Thrones without cable, this is a fantastic option for you. However, channels like Cinemax, Starz, and HBO are completely unavailable. Given DirecTV’s connections with the world of cable, it may come as no surprise that it has more support from major cable networks. You can log into the websites of 100+ different subscription networks with your DirecTV Now login. While YouTube TV also supports TV Everywhere, it lacks the extensive support that DirecTV Now has. If you are an AT&T Unlimited Choice subscriber, you are eligible for a big discount on DirecTV Now service. You can get the $35/month “Live A Little” package for just $20, which is a really good deal. You can get 60 channels (which is more than YouTube TV) for half of the cost of a YouTube TV subscription. For all of its benefits, YouTube TV is quite lacking when it comes to on-demand content. Unless you record a show with your DVR, you won’t be able to access much content on-demand, except from major networks like NBC, CBS, ABC and FOX. However, with DirecTV Now, you get access to 10,000+ streaming titles, and over 25,000 hours of on-demand content. New episodes of shows are usually available within a day or two of their initial airdate. The fact that DirecTV Now has such great on-demand content does help make up for its lack of a DVR, and is certainly something to consider when picking between these two services. If you’re still not sure whether you want to try YouTube TV or DirecTV Now, there’s good news. You don’t have to choose! You can try a free YouTube TV trial at their website now. And if you want to give DirecTV now a shot, you can visit their website at this link for a free 7-day trial. So, here’s the big question. Which internet TV streaming service is better? Depending on your needs, either YouTube TV or DirecTV Now could be the right choice for you. Here are some questions to ask yourself, which can help you make the right decision. If you want HBO and other premium networks like Starz, YouTube TV is likely not an ideal choice for you. You can get a much better deal on quite a few premium networks by subscribing to DirecTV Now. If you are not interested in a huge variety of channels, YouTube TV is probably a better choice for you. You still get plenty of coverage, as well as great features that DirecTV Now lacks. But if you need more choices, and channel packages that offer up to 120+ channels, DirecTV Now is likely the right internet TV streaming service for you. 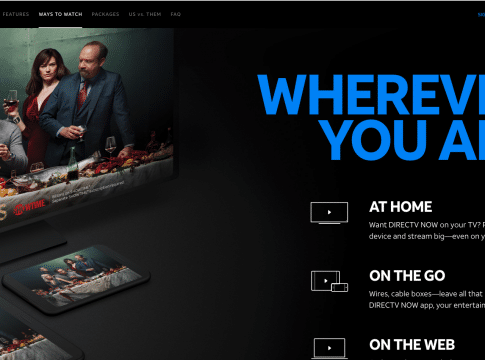 If you tend to watch your favorite shows live, and do not save shows for later viewing, DirecTV Now may work for you – despite the fact that it currently lacks a DVR. A release date for the 2-hour free Cloud DVR still has not been announced. However, if you like to record a lot of shows, YouTube TV is definitely a better choice. The 9 month DVR offered by YouTube TV is, quite literally, the best in the business. The closest runner-up is PlayStation Vue, which gives you 28 days of unlimited storage. In general, you’re going to have an easier time sharing a YouTube TV account than you will if you want to share a DirecTV Now account. This is because YouTube TV allows you to create up to 6 different users, each of which gets their own DVR and recommendations. In addition, you can watch YouTube TV on up to 3 devices at once. This means you’re less likely to be blocked from watching your favorite show due to too many users streaming at once. DirecTV Now, on the other hand, offers no DVR and only allows 2 users to stream at once. It’s not ideal for sharing with more than one other person.